Spirited bidding from the diverse buying bench saw increases in key metrics across the board at the end of the second day of the 2016 Inglis Premier Yearling Sale, with 87 per cent of lots cleared at an average of $115,625 so far. The average is up 17 per cent, median up 13 per cent to $90,000 and thanks to the healthy clearance rate, gross receipts are up 18 per cent on this time last year. CLICK HERE to view the InglisTV Day 2 Summary. Local and National buyers have led the bidding, but the top two lots on Day Two fell to Internationals from China and New Zealand. The colts by Sntizel and Teofilo were each purchased for $340,000 by the China Horse Club and Lance O’Sullivan respectively. New Zealand trainer Lance O’Sullivan went to $340,000 for a colt by Teofilo out of an unraced daughter of Fastnet Rock (Lot 339) from Three Bridges Thoroughbreds. O’Sullivan will take on the colt until he can be transferred to the stables of O’Sullivan’s brother Paul in Hong Kong. “He is an incredibly athletic and good-looking colt, and there is no doubt he is the perfect type of horse to race in Hong Kong, which is the long-term goal for him,” said O’Sullivan. Earlier in the day a smart colt by super-sire Snitzel out of Miss Iguacu (Lot 205), an sister to Group 2 winning stallion Niagara and from the family of Redoute’s Choice sold for $340,000 from the draft of Glentree Thoroughbreds. “We’re delighted to get a result like that, and with the purchaser China Horse Club, and we are confident he’ll get every chance with them,” said Glentree Manager Luke Simpson. “We’re proud Victorian breeders, and the colt was bred, foaled, raised at our farm in Modewarre and obviously sold through Glentree Thoroughbreds. “The colt was the first foal of the mare and we have a lovely full-sister to come, and Miss Iguacu is definitely an important part of our broodmare band,” Simpson said. 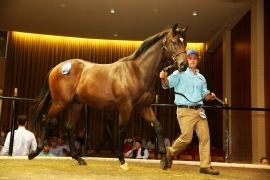 Michael Wallace signed for the colt on behalf of China Horse Club, which has outlaid a total of $790,000 on three lots in the first two days of selling. “The horses are purchased to stay in Australia and encourage Chinese interest in Australian racing, and most will be trained by Snowden Racing,” said Wallace. 12 Lots were secured by Chinese investors for a total of $2,455,000, with the majority to stay in Australia to race. The local industry has benefited from interest from Chinese-based interests including YuLong Investment and RIFA Mustang Pty Ltd that recognise the gains to be experienced from buying and racing thoroughbreds in Australia. “All sectors of the buying bench have been active across the board, which has driven forward all key metrics and delivered excellent results for vendors,” said Inglis Victorian Director Simon Vivian. “We are delighted to see buyers new to Premier have been active throughout the sale, along with buyers who have had success with graduates of the sale returning to invest in the quality product on offer,” said Vivian. Buyers who have had Group 1 success from Inglis Premier have been active again this year, including Peter Moody (Black Caviar, Pasadena Girl), Gerald Ryan (Snitzerland), Triple Crown Syndications (Hot Snitzel), John Foote/Darren Weir (Trust In A Gust), Chris Waller (Good Project), Robert Smerdon (Shamal Wind), and Form Bloodstock (Alboran Sea). Inglis’ Make-An-Offer Service is available for lots which passed-in on the first two days of the Inglis Premier Yearling Sale. Day Three of the auction starts at the earlier time of 10:30am tomorrow, where Lots 363 to 573 will be offered and will be broadcast on via Racing.com’s great free-to-air coverage on Channel 78 and Inglis Sale Day Live, plus Online Bidding and Make-An-Offer will again be available.